View cart “Nail Master 1 freehand” has been added to your cart. Get the new Artool HOTHEADZ Freehand Airbrush Templates, designed by Mike Lavallee, while their hot. Hold onto your hats because it’s gettin’ hot ‘n scary in here! For a few years, the world of kustom painting hasn’t been the same since the creation of Mike’s True Fire® airbrushing techniques. Now Mike turns up the heat a few notches with his outrageous skull offerings, which are sure win over the hearts ‘n souls of kustom auto painters everywhere. They’ll save you a ton of time in creating something completely wicked for your rod or chopper. 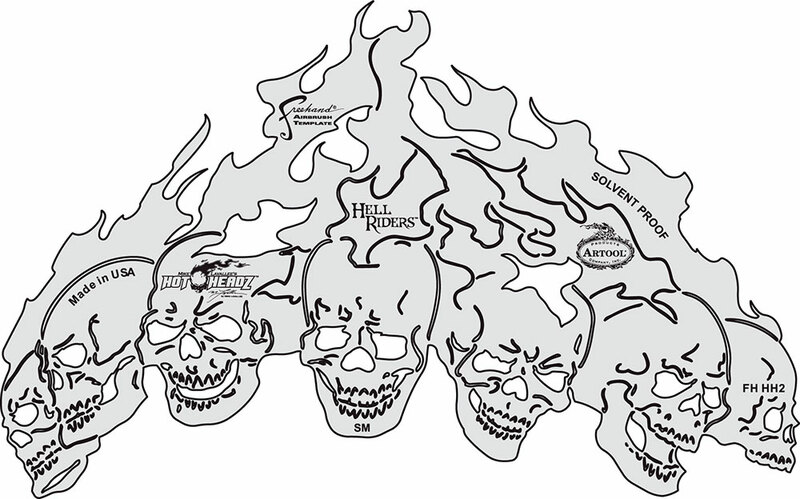 There are two sets of HOTHEADZ to choose from, which contain 4 sizes in S through XLG: SMOKIN’ JOES (FH HH 1), and HELL RIDERS (FH HH 2).